"Where America can buy Plotter Paper Rolls CAD or Inkjet"
Thank you for visiting us. Our Plotter Paper, Rolls Inkjet, Engineering Bond, CAD Papers Roll American made and we support American plotting with CAD Paper Plotter Rolls or in Sheets. Learn how Inkjets Plot CAD Papers, which get processed for plotting cad plot check, are found on 2 inch Core Inkjet (often Photo) Plotter Media. We specialize in American made 3" Core and 2" Core Roll CAD Inkjet Bond Plotter Paper delivered to your office, company, home, or business in HP, Canon, Epson, Oce, KIP, Xerox® and more. Get it right the first time with USA Plotter Papers Roll Sizes. 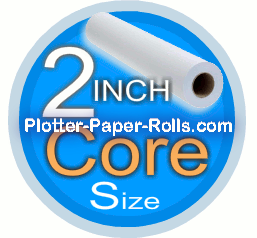 Plotter 36" Roll Waterproof Paper, 36 Inch or Sizes 42"
United States inkjet plotters use 11, 12, 13, 15, 17, 18, 22, 24, 30, 34, 36, 42, 50 and 60 inches plotter paper roll size or blueprint sheet sizes. One may find drafting sheet or roll printing sizes required by local or state Department of City Planning and Zoning to be a bit different depending on the state or policy of the office in which printed plans are filed. All material and sequestered widths are pre cut here then sent for wide-format plotter inkjet printing. HP Paper Paper Roll likes and HP Printing Media is here. We serve US Office Supplies with best of all quality American Made 2 & 3" Core Engineering Plotter Sheet or Roll Papers available to the public with a guarantee.